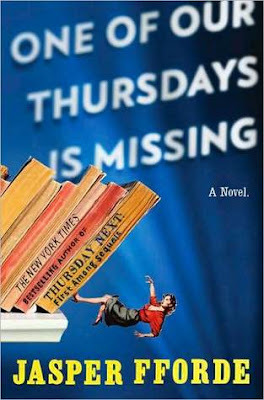 One of Our Thursdays is Missing [Book Review] – my books. my life. Thursday Next is missing. With genre wars about to erupt between Racy Novel and Women’s Fiction after the remaking of the book world, the Council of Genres can’t afford not to have her around. So they ask fictional Thursday Next (the hippie Thursday 5 from the previous book) to pretend to be her. Fictional Thursday, embracing the role, gets caught up in a mystery that would take far to long to explain here. I read this quite some time ago and I have to admit that not much stuck with me. However, this does not sadden me much. Let me explain. I missed the real Thursday Next. A lot. It made this my least favorite book in the whole series. While I appreciate that Fforde was trying something different here, it’s really hard to have an entire book without your series’ protagonist. The re-envisioning of the book world into a physical place allowed fictional Thursday to explain what exactly it means to be a fictional character, which was an interesting new take on the series. We’ve seen hints of it since The Eyre Affair but we’ve never actually experienced the day-to-day duties of being read. On the other hand, we spent hardly anytime in the “real” world and that was a loss I felt almost as much as our missing Thursday Next. This book was funny and witty and entertaining just like all of Fforde’s works, but it strayed too far away from the Thursday Next series I love so much to win me over. I have read every book in this series and have been dying to read this one too, but it does sound as if this is a bit of a departure for Fforde in the context of these books. Frankly, I am kind of skeptical about how this book will read, but being a huge Fforde fan, I can’t just skip this one, because I adore his work. I am curious to know if you have read any of the other books that he has written that are not part of this series? I read Shades of Grey which was very good but the sequel isn’t out for ages. I haven’t read the Nursery Crimes series yet but my husband enjoys them. You? I saw your tweet, and I felt so bad. You know I love you. It’s just been one of those days. But here I am, better late than never. So. Never read the series, but I was influenced to get some/any of them on audio. The only one the library had was this one. Dare I read it first? Dare I read it at all? I just have no time for any more print books in my life right now. I already have 2 million. I definitely recommend reading these in order. They are confusing enough that way. But the audios are fantastic.